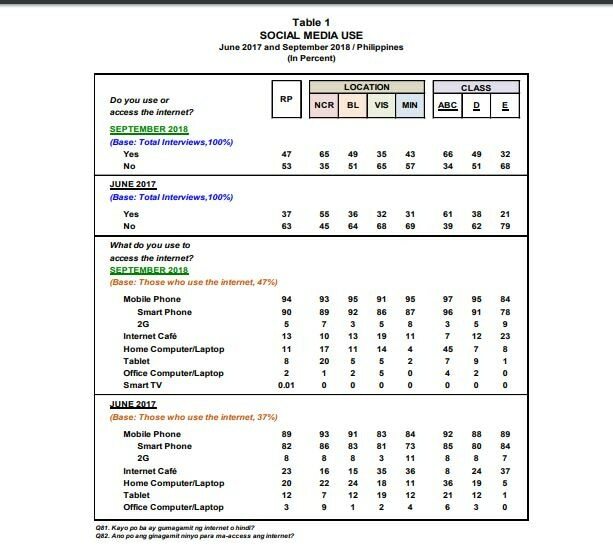 MANILA - Nearly all Filipinos who have internet access go online to use social media but only half said these affect their political views, with a majority aware of the prevalence of fake news in the internet, a recent Pulse Asia survey showed. The survey, released a day before the start of the filing of certificates of candidacy for the 2019 midterm elections, showed that only 47 percent of 1,800 respondents had access to the internet, but that 98 percent of them go online for social media. All Filipinos who use social media have Facebook accounts, while only 17 percent use Instagram, 11 percent have Twitter and only 2 to 3 percent were engaged in LinkedIn and Pinterest. Internet use was reported by a majority only in Metro Manila and "the best-off" Class ABC (66 percent), while only about a third in the Visayas (35 percent) and those who belong to Class E (32 percent), the poorest, go online. Among those who have internet access, 94 percent said they use their mobile phones, 13 percent said they go to internet cafes, 11 percent have their own computers, 8 percent use tablets, while 2 percent use their office computers. The survey also showed an increase in internet access from last year, as only 37 percent of Filipinos, a majority of whom belong to the upper classes from Metro Manila, could go online, based on a June 2017 survey. The survey found that most Filipinos or 79 percent believe that fake news "is widespread on social media," Pulse Asia said. social media becomes more pronounced at the national level," it said. Seventy-eight percent of Metro Manila and Mindanaoan netizens agreed that fake news has been proliferating online, while 80 percent of Visayans and 79 percent of those from Luzon also agreed. social media," the study showed. There was a near even split, meanwhile, on how respondents gauged social media impact on their political beliefs: 51 percent said they have "changed their views concerning politics and government" because of online posts, while 49 said they did not. There was a increase in those whose political views were affected by social media, as only 39 percent of respondents in a June 2017 survey gave the same response. Though the number of respondents with internet connection increased by 10 percentage points this year, fewer Filipinos use the internet to "update themselves with current events or to send, receive, and/or read emails," Pulse Asia said. The number of respondents who "read, watch and listen" to news online dropped to 29 percent in September 2018, 6 percentage points lower than 35 percent in June 2017, it said. The use of emails among the respondents also dropped to 20 percent in this year's study, also down 6 percentage points from last year's 26 percent. Fewer respondents also said they go online for entertainment. Filipinos who surf the web to watch movies, view recipes and access "other things of interest" dropped to 39 percent this year, compared to last year's 41 percent. Barely half of the respondents or 44 percent said they access the internet "more than once a day," while 20 percent said they only go online "once a day," Pulse Asia said. A separate study earlier this year showed the Philippines has been the "world's top social media user" for 3 consecutive years. The Philippines emerged as the country that spent the most time on social media, according to a report by creative agency We Are Social and social media management platform Hootsuite. An average Filipino social media user spends almost 4 hours on different platforms daily followed by Brazilians and Indonesians, respectively, the report said.